The brisk chilliness of the house in the fall is the familiar companion that welcomes me first thing on a weekend morning. It envelopes my tired fragility and nips at me playfully as I rise from the cocoon that is my warm bed, hair disheveled and face imprinted with pillow lines, until I lessen its effect by wrapping a double layer of robes around myself while I adjust to the morning hour before coffee. The house lays dark, undisturbed from its own slumber through the night, until the sound of window shades being pulled up to reveal a pale daybreak punctures through the silence. I open the door to my favorite realm which doubles as a bedroom for our dog Lola — the kitchen — and give my lazy, warm girl a tussle of her fur and a warm “good morning, love” as she stretches. I flick on my mini coffee maker and take Lola out for her morning “outing” while the coffee drips and becomes an anticipated hot comforter. A lingering, lazy, fall weekend morning. There’s very little quite like it. It contains the potential to be absolutely marvelous, and the best day ever. It’s full of hope. It also contains all of the possibilities of a decadently comforting and soul-warming breakfast, one that is at its most divinely delicious on just such a lingering morning. The sheer knowing that I don’t have somewhere that I must be automatically sends my desire and my imagination to a place where I can treat myself and my family to a bonded togetherness through a comforting morning meal. A Monday or a Thursday just doesn’t evoke a desire for an easy-going and special breakfast, but boy does a Saturday or Sunday morning in the cooler season. Sweet syrup, spices and rich, buttery bites can almost be tasted before any are even produced from the hot stove, and a slow, deliberate process can almost be envisioned and enjoyed before it is even embarked upon. 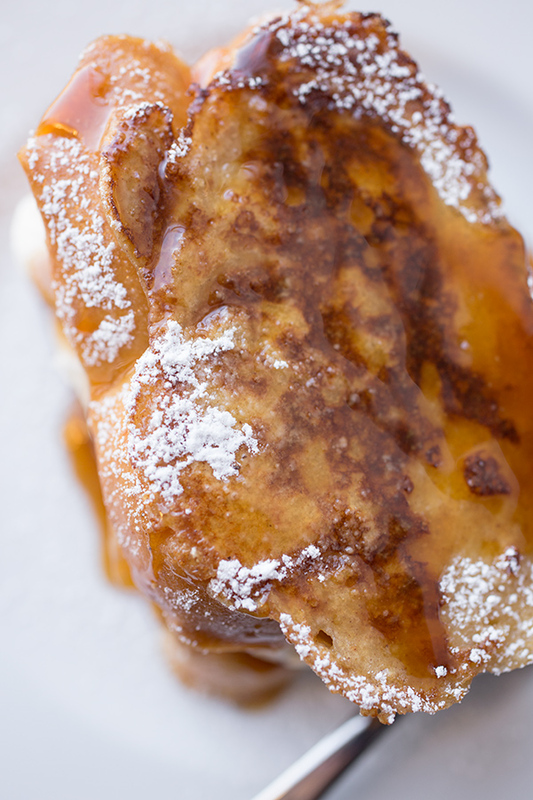 French Toast is like a pillow for the tongue, a fluffy, fragrant, melt-in-the-mouth sweet pleasure; and it is one of my favorites on a morning that lasts for hours. 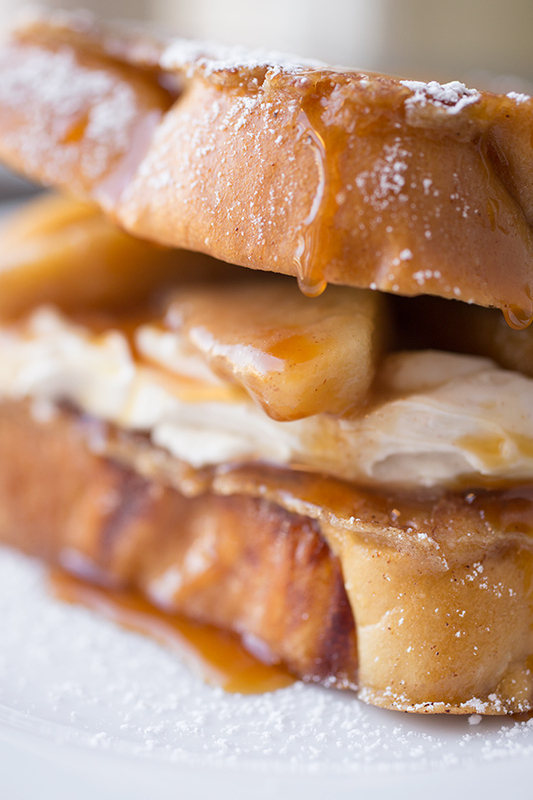 Seasonal apples, brown sugar, warm cinnamon, rich cream cheese and a drizzle of maple-caramel syrup, becomes sheer bliss and a little taste of heaven while the life all around me lounges around and yawns widely. 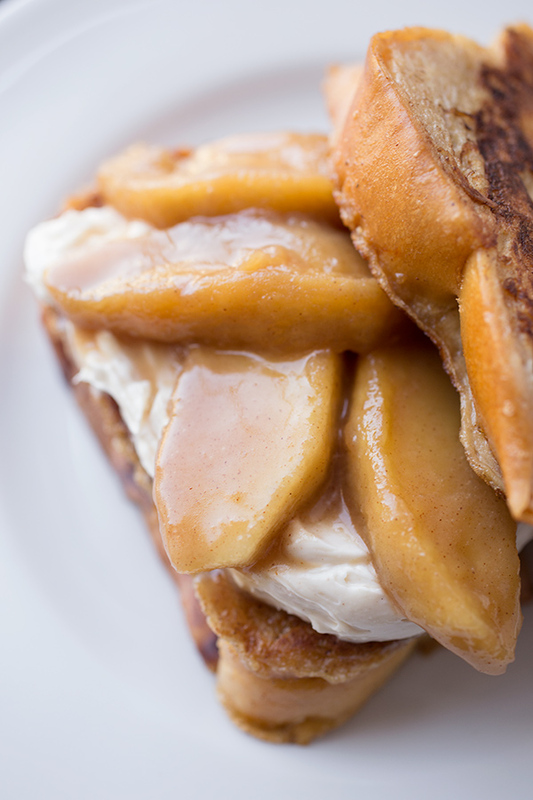 If the chilliness of the house is what my body awakens to on a fall weekend morning, then Caramel Apple “Stacked” French Toast is what my heart and soul eagerly respond to. Comforting sweet eats are the gifts that we wait patiently for all week long while we are being ripped from our sleep way too early, and rushed into action before we’re ready. The taste of a little extra love and nurture and the kiss of some sugar & spice and caramel-maple syrup on my lips is the flavor that my spirit longs for on a lazy weekend morning. -Heat the oven to 200° or “warm” setting, and place a wire rack-lined baking sheet into the oven. -Add the cream cheese, the 2 ½ tablespoons of powdered sugar, ¼ teaspoon of the pumpkin pie spice, and ¼ teaspoon of the vanilla extract to a bowl, and using a hand mixer, blend the mixture until smooth and creamy; set aside. -To caramelize the apples, place a large non-stick frying pan over medium-high heat, and add the 2 tablespoons of butter in; once melted, add the apples in and saute them for about 3 minutes, until softened and lightly browned; add in 3 tablespoons of the brown sugar and the pinch of cinnamon, and continue to saute them for another 1-2 minutes longer; pour into a bowl, and keep warm. 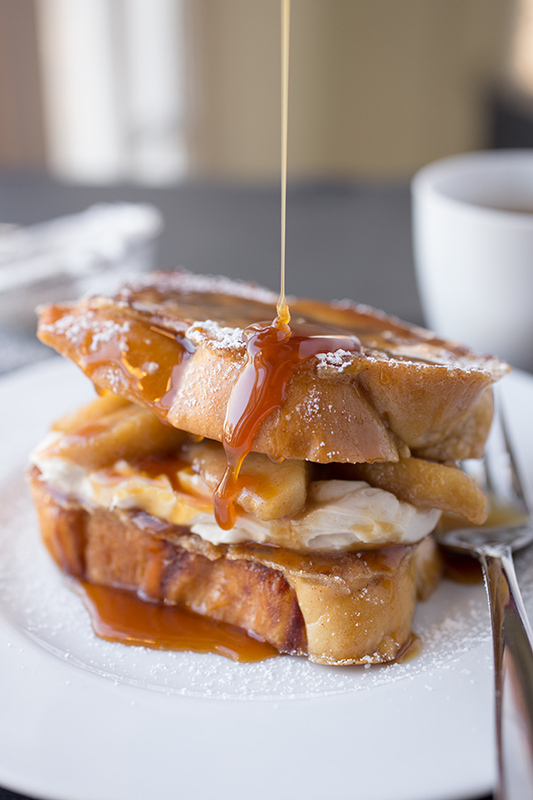 -Prepare the french toast batter by whisking together the eggs, the half and half, the remaining 1 tablespoon of brown sugar, the remaining 1 teaspoon of pumpkin pie spice and the remaining 1 teaspoon of vanilla extract until well blended. -To fry the french toast, place a large non-stick frying pan over medium heat, and once hot, rub a stick of butter in the hot pan to coat the bottom liberally; dip a piece of the bread in the batter to coat both sides well, then add it to the hot buttered pan and allow it to brown for about 2-3 minutes per side (do a couple of pieces at a time if possible); place the cooked French Toast into the warm oven to hold while you prepare the remaining slices. 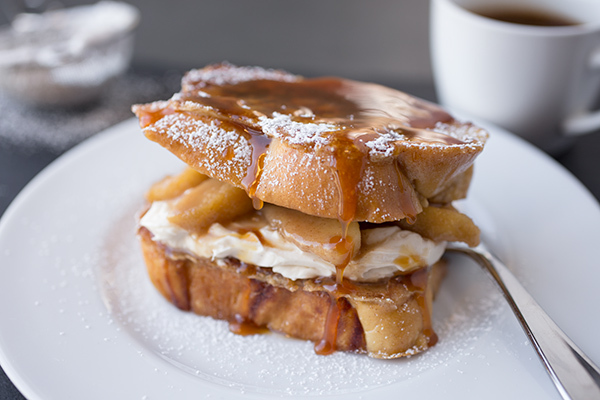 -To assemble, place one piece of the french toast onto a plate, and spread on a couple of tablespoons of the spiced cream cheese; add about half of the caramelized apples over the cream cheese, then top with another slice of french toast; sprinkle over some powdered sugar, and drizzle with some of the warm, Maple-Caramel Syrup. -Add all ingredients to a small sauce pan, whisk to combine, and heat on low just until warm and well blended; serve warm. You have outdone yourself! These look sensational! The photography is brilliant and I want to eat several stacks right now! I can’t wait to make these when I get back from vacation. Well thanks so much, Lindsey! And I hope that you’re enjoying your vacation! Oh wow, I’d love this for breakfast every day!! Amazing. Wow!! This looks absolutely amazing!! Can you use apple pie filling instead of real apples? Hi Bonnie, for that I would stick to the French Toast Casserole. This recipe could technically be made ahead if you were willing to make the individual pieces of toast ahead of time, and then re-heat them in the oven the next morning til warmed through a slightly crisp on the outside; but I really think fresh French toast is best. You could also prep the cream cheese, the apples and the syrup (if making) the day ahead too, and have those ready. But I don’t have a method for this where you could just put everything into a baking dish and bake it off. That would be more the other recipe. 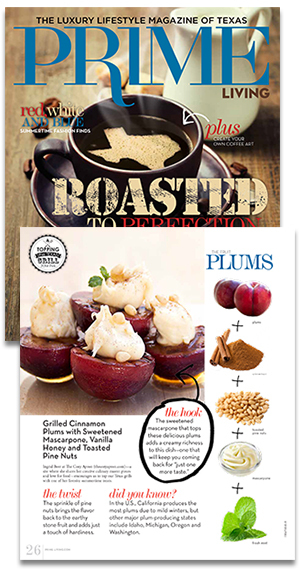 Another option: make the French toast casserole, and top it with (or serve on the side) the caramel apples, syrup, even the spiced cream cheese from this recipe, or let folks top their own individual portions with those goodies. Or, you could prep my blueberry compote and serve it with that. So good! 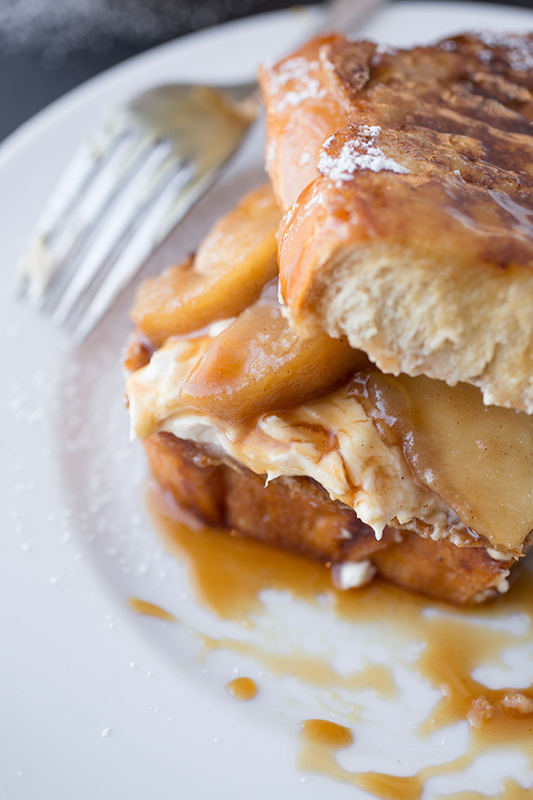 Either recipe you choose to do (or combination thereof), hope you enjoy your sweet breakfast!